Every year they also provide scholarships to students in the district and winners walk in the North Aurora Community Parade in June. Two seniors, from North Aurora or West Aurora High Schools are chosen for the scholarship and crowned the “King and Queen” of the parade. 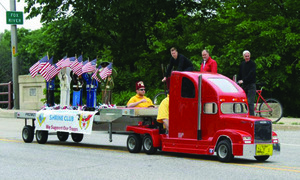 For the past six years the club has organized the parade and it’s just one of the many events held that gives back the community. This past February, their 18th Annual Winter Gala “Meet me at the Speakeasy” took attendees back to the roaring 20s. The gala is their largest fundraiser and included a raffle, silent auctions, 50/50s and more. They also host the annual community dinner in January, which is free to all North Aurora residents. Another fundraiser, Operation Christmas brings light to families in the community during the holidays. Every year they help an average of 40 families, totaling over 200 children, by partnering with local businesses, organizations, and individuals to give families items on their wish list. The Giving Tree, put up each year at Messenger Public Library, allows the community to participate by taking a wish card from the tree and returning items on the list to the Library. The NAMC is open to anyone interested in helping the community and members can join any time of the year. Their members are “committed to improving the social, emotional, educational, and physical well being of the children and families of North Aurora, Illinois, and its surrounding communities.” The club meets the first Tuesday of the month from September through August, with a member’s banquet held in late August. Meetings are held at 7:30pm at First State Bank, North Aurora. For more information contact president@namothersclub.org.